Gorgeous views of Mt Constance from the summit of Point 5345 and a great workout of ~8 miles and ~5000' gain. Due to a new washout, the end of the Dosewallips Road now appears to be ~1.5 miles shy of last years 'end of road'. This means we had ~0.25 miles of road walking to reach the trailhead from the cars. Surprisingly good weather with intermittent to totally clear skies (in our area) most of the day. 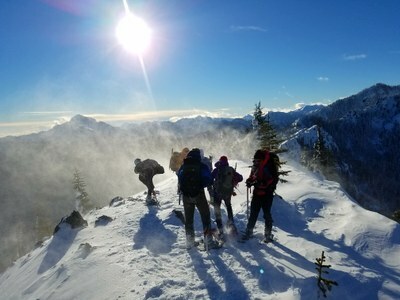 Ran into snow at ~2500' and put on snowshoes at ~3500'. Temps in the 20s and winds on the summit kept our appreciation of Mt Constance brief as well as affording Megan Cromar's beautiful summit spin drift photograph (which you can see here). Photos from the entire trip can be seen here. Total trip time was 8.5 hours which included 4.5 hours for ascent.